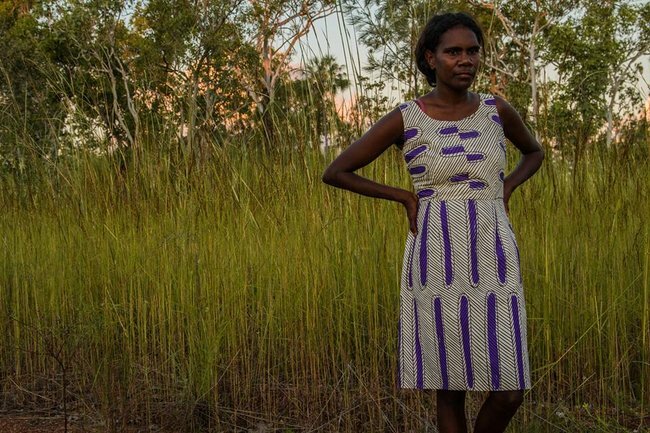 The social enterprise creating bright and bold statement clothing from fabric designed by Aboriginal artists. 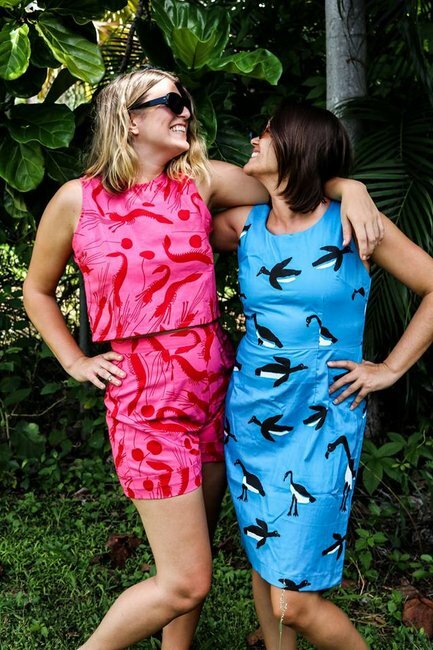 Maggie McGowan, and her co-founder Laura Egan, created Magpie Goose with a mission to bring fabulous Aboriginal art to the world through fashion, while offering enterprise learning and employment opportunities to Aboriginal people in partner communities. In April 2016, Laura asked Maggie what she would be doing if she wasn’t bush lawyering. 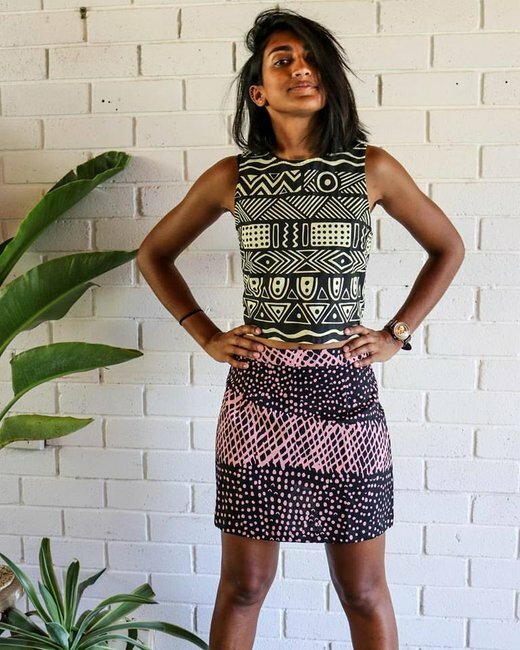 Her mind immediately turned to the fabulous hand screen printed textiles designed and printed in remote Aboriginal communities. These textiles tell stories of people, dreaming, landscapes and traditional motifs in a bright, bold and fun contemporary format. 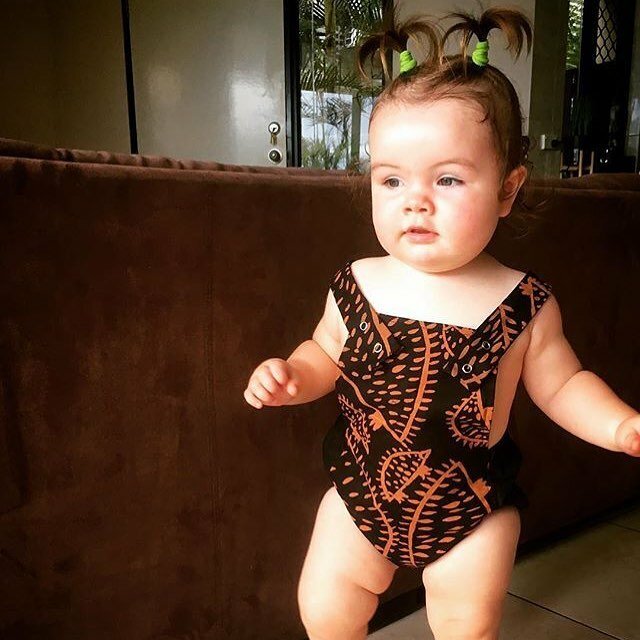 Read Maggie’s interview with Mamamia. 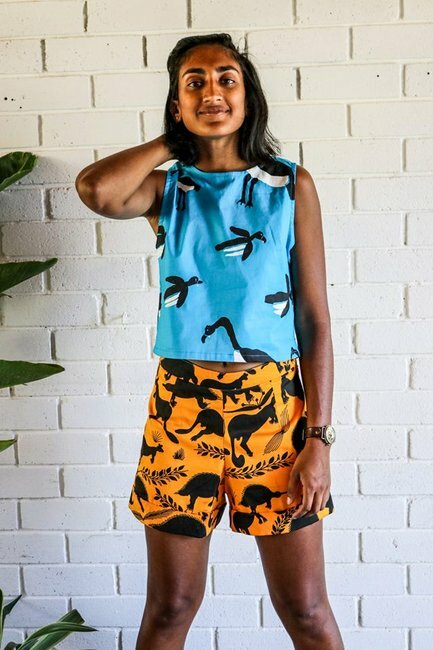 Magpie Goose is a social enterprise creating bright and bold statement clothing from fabric designed by Aboriginal artists, and hand screen printed in Australia (some in remote communities and some in Sydney). The first range features simple, statement pieces that let the textiles do the talking. Since September 2017, Magpie Goose is 100% Australian made, with clothing manufactured in Sydney. 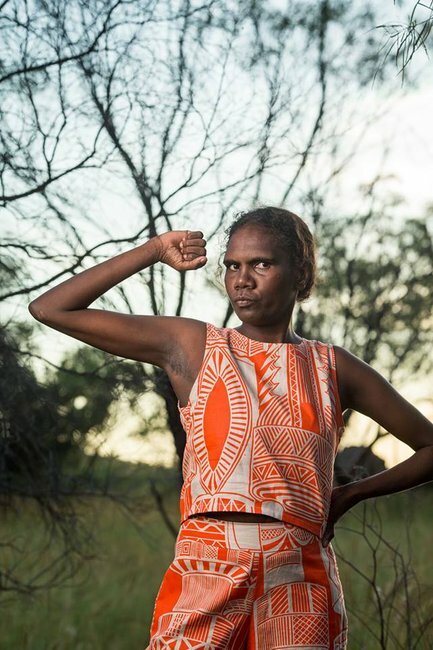 Magpie Goose’s mission is two fold: to share Aboriginal art with a wider audience through fashion, while creating economic and enterprise learning opportunities for Aboriginal people in remote Australia. Maggie McGowan (left) and Laura Egan (right). Image via Facebook. What were you doing before you went into business for yourself? I was working as a civil lawyer at NAAJA (North Australian Aboriginal Justice Agency), travelling between Darwin and remote top end communities assisting people with housing, Centrelink and consumer law issues. I was compelled to leave my job as a lawyer to create a social enterprise that could offer meaningful and fun employment and enterprise learning opportunities for people in remote communities. Through my work, I saw the devastating effects of the punitive welfare system that is currently in force - Community Development Program - which is essentially work for the dole. It requires people to do either belittling activities such as painting rocks or paper quilling, or unpaid manual labour that should be paid such as mowing lawns or fixing houses. I had met so many people through NAAJA and had experienced first hand the incredible cultural knowledge, art and stories that come out of remote communities. I knew there was a craving among non-Aboriginal Australians to connect with and value Aboriginal people and their culture, but there weren&apos;t many opportunities for this connection. So, Magpie Goose was born. Magpie Goose is named after a bird native to the top end of Australia. The magpie goose is classic and stately (black and white), but also quirky and wild. It sits at the very top of the mango tree eating mangoes and laughing all day. Our brand is loud, proud and unapologetic so it seemed kind of perfect! Describe the staff/ownership structure of Magpie Goose. Magpie Goose is co-founded by myself and my partner Laura Egan. I am currently the full-time business manager and Laura works a few days a week doing planning and strategy. 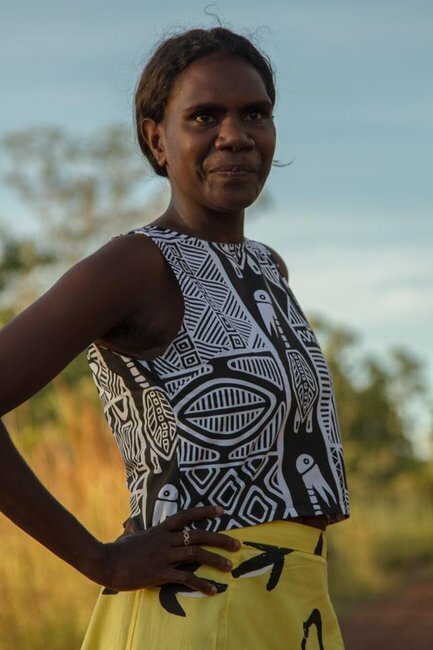 She is also CEO of Enterprise Learning Projects, an organisation that works in partnership with Aboriginal communities to use enterprise as a tool for engaging with the economy. Did you require investment to start your business? Initial start up investment and business support came from Enterprise Learning Projects. The initial funding of $10,000 enabled us to buy the first round of fabric from four top end art centres, and get this made into 170 items. What kind of advice did you get before you started and from who? Laura has over seven years experience working in partnership with Aboriginal communities. She&apos;s got plenty of valuable advice, including that you can social change through business! What&apos;s the single best piece of advice you got? From Margaret Duncan, Laura&apos;s Aboriginal mum and Enterprise Learning Projects board member. She said, "Aboriginal people have the skills and the talent and the stories, they just need a chance to be able to do it." At Mamamia we have an expression "flearning" - failing and learning. What have been your biggest flearnings since you have started your business? Our whole journey to date has been one flearning after the other. I don&apos;t think we&apos;d take any of our flearnings back, as they&apos;ve been necessary steps in developing our business/fashion label. From sizing issues, adapting styles, international shipping and all things that can happen when screen printing in remote communities, every lesson has had to be learnt for us to refine and move on. One specific flearning has been the dramas of sending big boxes of expensive hand screen printed fabric over to Bali (where we were getting things manufactured in the early stages). TNT was cyber-hacked and several boxes were lost in space for two months, things get held up in customs and stuck in various places. We switched to Australian manufacturing partly as a result of the international shipping flearnings. What&apos;s the smartest thing you&apos;ve done since starting Magpie Goose? Acknowledging what skills we don&apos;t have and looking for people to partner with who do have these skills. Are there any pieces of technology or software, apps or systems that have made it easier to do what you do? Xero, Shopify, Facebook and Instagram. How many hours a day do you work on Magpie Goose? Has this changed? Magpie Goose was dreamed up in April 2016, and from then until March 2017 I was working at NAAJA full-time, working on Magpie Goose after work and on weekends. It was very similar for Laura. Since March 2017, I have been working on Magpie Goose full-time from 8am to 5pm every weekday, and some weekends. Leisure! I need time to totally switch off and not think about responding to emails or messages. I am pretty good at just saying I&apos;m going to have a Sunday off now, or I&apos;m going to have a beer and tend to my passionfruits. What&apos;s the biggest misconception you had about starting your business? I would have thought that to start a fashion label you&apos;d need experience in fashion, a fashion degree or a business degree. But I have found that as long as you have good people around you, and admit to yourself what skills you don&apos;t yet have or might need to work on, you can do almost anything. Tell us about your proudest moment. Our proudest moment to date, aside from being star-spotted int he line for pizza in Coober Pedy and being a crossword clue for The Age, is being able to offer screen printing training and employment to five Aboriginal job seekers in Katherine. These guys have been participating in the Community Development Programme for many years, with little chances of employment. They all have aspirations to get off Centrelink and make a career as an artist or screen printer. What does your personal life look like? My partner and Magpie Goose co-founder Laura and I have a house in Katherine, Northern Territory. 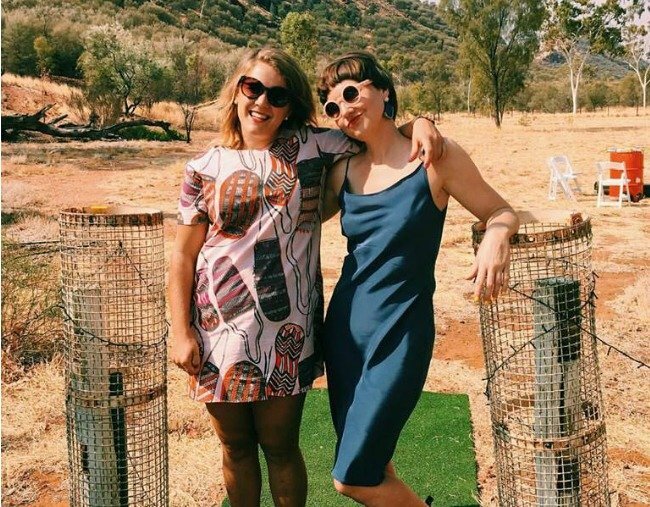 We&apos;re both from country Victoria so we have lots of family and friends in the south, but have surrounded ourselves with lots of fabulous people in Darwin, Katherine and Alice Springs. What can you recommend to women who might want to get their own hustle going? Make sure there are people who want to buy your product or use your service, and understand who these people are. Know your point of difference. There are so many things out there, and I wouldn&apos;t be adding more things unless there was an actual need or market for them. We have a few fabulous mentors in the fashion and financial services industries. It&apos;s very helpful to have extra people on your team to run things by, and make sure you&apos;re on the right track. Since we&apos;re in the #LadyStartUp spirit, which Lady Start Ups do you recommend? Ingo - bold and colourful dangly earrings. Hello Julie White - colourful prints, textiles and accessories. Edith Rewa - textiles, illustrations, art prints and silk scarves. Indigital - Indigenous culture in digital forums. North Home - Indigenous textiles, homewares and fabrics. You can see more from Magpie Goose at their website, Facebook and Instagram. Got January-Dread at the thought of a new year in your current job? Keen to take control of your life and be your own boss? Come and join Mia Freedman for the Lady Startup Activation Plan, an online course where she personally takes you through every step and gives you every resource to go from idea to launch. Enrolments are open for just a few days. Details here.